Our Partner a Master program for this month was about setting the tone in a bid to inspire students to visually savour the rich history of pottery, in tow with ceramic artist Kristine Michael. 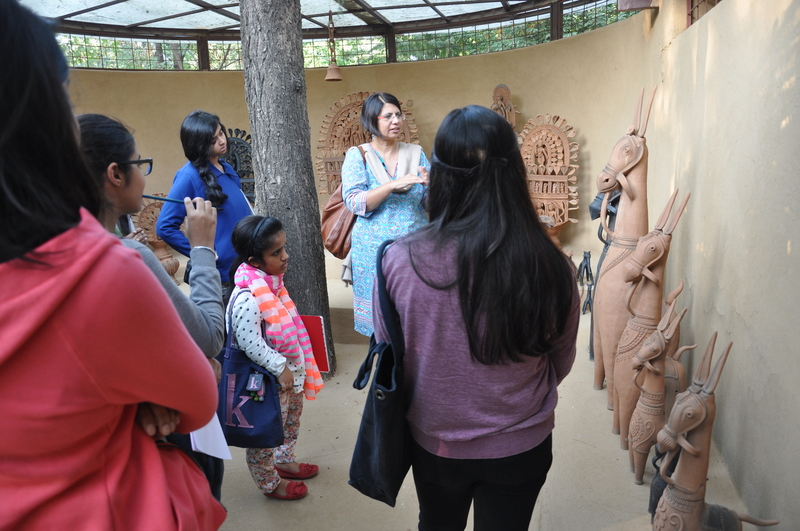 Under her mentorship, students were taken to the potter’s museum at Sanskriti Kendra, Anandgram to have their senses allured by the artistry and craftsmanship. The premise behind the museum visit was to soak in the visual imagery that our ancient and contemporary history has been rife with, over centuries. The spanning over of material culture, housed at the crafts’ museum gave the students a lucid entry point into the history of the same. Students made drawings of fine anatomical details, jewelry patterns and intricate mural paneling that the museum was dispersed with. 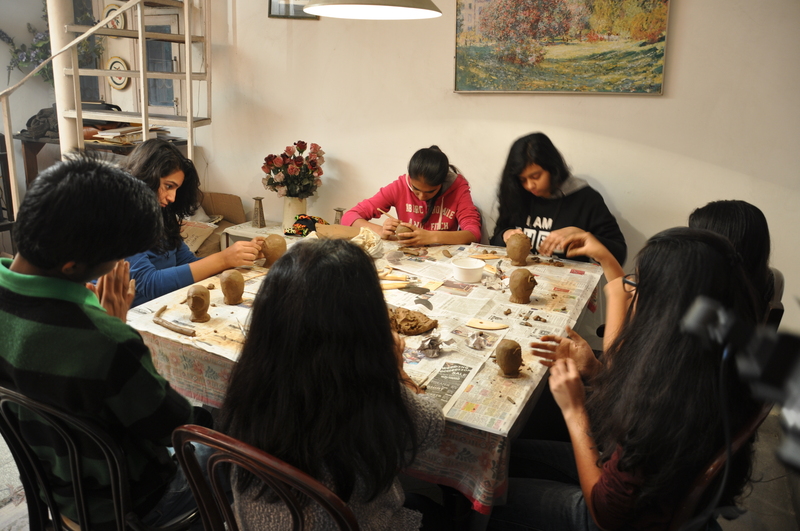 After a flurry of activity at the museum, the preceding sessions were at the artist’s home studio where the students played out their conjuration through the medium of clay. Kristine took them through some of the techniques and tools that are immaculate in the world of clay. 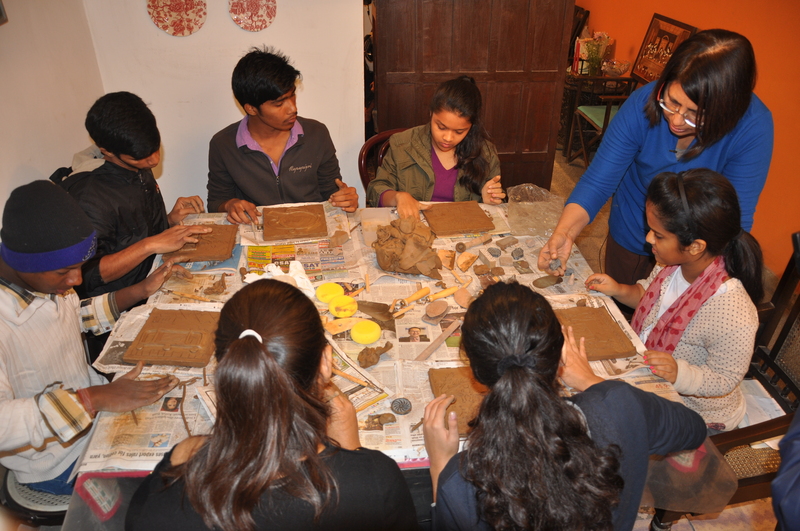 Equipped with those learnings, students made their individual foray using clay. They made portraits, coiled pots, individual tiles for a holistic mural and composite creatures inspired from the visit at the museum. Employing varied artistry into creating individual skilled products gave the students a new window into the world of pottery. Our mentor took them through the nitty-gritty of firing the clay in the kiln. She gave them hands on display into the modus operandi and dexterity that go into its aesthetic value. In the words of Sama, her “favourite part was the tile making where I depicted a marriage scene and used magnesium dioxide to paint it; this was the first time I had ever done something like this”. 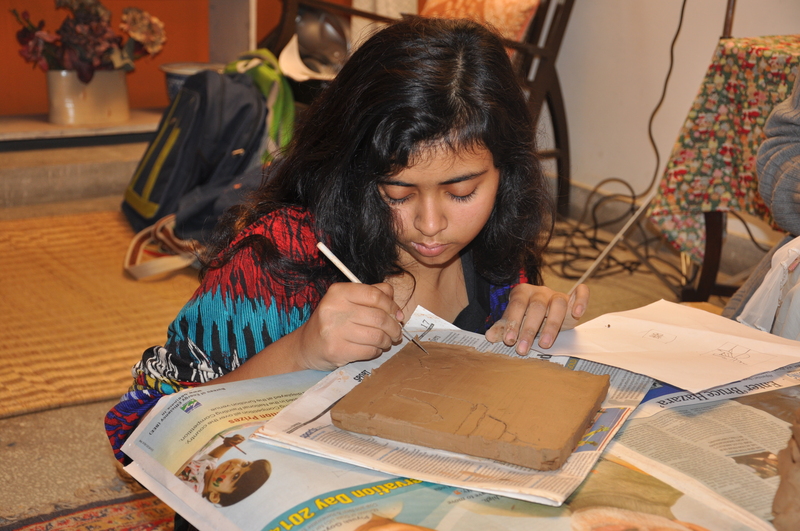 Students dabbled in the tactile material of clay, bringing to fruition, their own genesis.